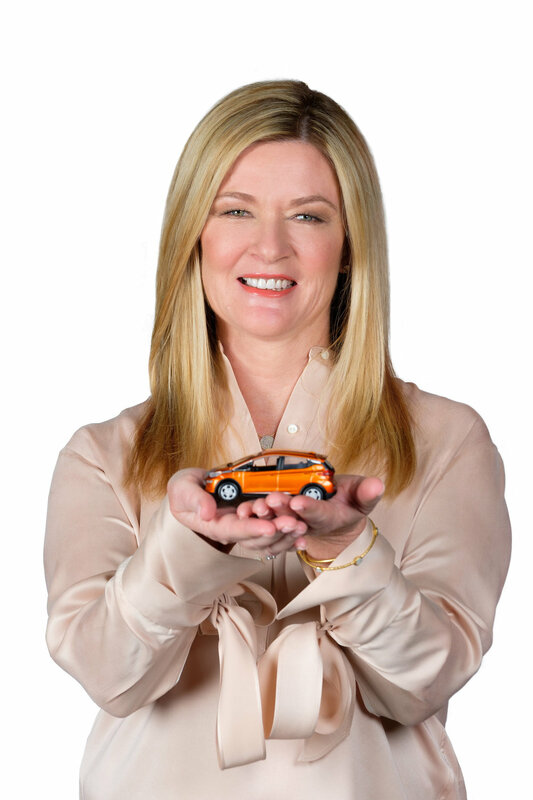 Pamela Fletcher is leading the charge of electric vehicles. After overseeing the development of the breakthrough Chevrolet Bolt EV, a $37,500 all-electric hatchback that can go 238 miles on a single charge—the first electric car to achieve that kind of range at such a low price point, she aimed higher. And cleaner. Toward a zero-emissions world. More from the woman finding new roads below. You've been named one of Fast Company's Most Creative People of 2017. For you, how do creativity and business work together? Without creativity, there is no business. Right now, at General Motors and Chevrolet we’re reinventing the transportation sector to achieve a vision of zero emissions, zero crashes and zero congestion. This is a new roadmap. It requires creativity as we look for ways to capture customers’ hearts and minds with solutions they might not have considered in the past, such as electric vehicles, ride-sharing, and autonomous technology. How do creativity and cars work together? As with so many industries, there is no one way to put the puzzle together. At the beginning of the all-electric Bolt EV program, the team had a blank slate. We brought together different thinking from all parts of the company to create options for an affordable, versatile all-electric vehicle. Even after one vehicle was selected, we kept going back until we got it right. Creativity belongs throughout the whole vehicle process. You're leading your team at GM toward the mission of a zero-emissions world. We imagine you have to get creative here. You're doing something that's never been done before. How do you manage the day-to-day of that? Achieving zero emissions won’t happen overnight, or on my own. It’s important to keep an eye on the larger mission while getting laser-focused on the specific goals. For Bolt EV, we aimed for an electric range of over 200 miles. It’s a big step in itself to translate the overall mission down to the individual level. One size doesn’t fit all, and as we look toward a world of zero emissions, it’s true as well. We must transform our vehicles into the future solutions consumers need. How are you looking big picture? Zero emissions, zero crashes, and zero congestion is now the driving force for every project. Nowhere else I could work has this scale and scope. This is literally changing the world. Were you always interested in engineering? We'd love if you shared an anecdote from your childhood that sums up your career trajectory. My dad enjoyed racing, and my family spent the weekends on the track. I don’t have any brothers, so I was the one in the garage with my dad learning how everything worked. What began as a love of cars and speed has transformed over my career into a love of the technology at the heart of mobility. As I look back at the common thread on projects I’ve taken on, it’s been making technology available and exciting. Where do your drive and passion come from? I’m a lifelong learner, and my drive comes from the opportunity to continually re-invent, improve and understand how items work. The pace of technology and its evolution is the fastest it’s ever been, and I can’t imagine a more exciting space to work. How do you feel as a woman in STEM? I don’t find myself exceptional because since I was a child, anything I was interested in my parents encouraged. I never heard “girls don’t do this.” That encouragement has translated into me working in areas that I’m interested. It works for me; I can’t imagine doing anything else. How have you successfully navigated such a male-dominated field? If you’re doing something you’re genuinely interested in and doing the best work you can, your contribution will stand out. I think it has to come from inside, and finding where and how you can engage and participate in areas you are passionate about. What are your hopes for young women who are interested in STEM? Number one, I hope they’ll consider STEM. When I look at my career and friends’ careers that are in STEM fields, most have found them very rewarding. If STEM is for you, then pursue it with everything you’ve got. If it’s not, that’s OK too. Just don’t rule STEM out upfront. What's something you'd like people to know about your job that they probably don’t? My job is the best of both worlds: I’m looking ahead to the big picture and how to transform mobility as well as being grounded in the details of bringing technology to life. "Take the risk and do what you love." What about your career makes you feel the most complete? There are many moments, but I love when you launch a vehicle and then you are driving to dinner and the car you worked on passes you on the road. It’s such a great feeling because those people chose to spend their hard-earned dollars on something you built. It’s not a small decision. Cars are the second largest consumer purchase after a home, so I feel very proud to see vehicles succeed that my team engineered and built. At what point in your career did you find the confidence to really take charge and become the woman you are today? I can’t identify a specific point, but I can say that I’ve always made choices to do things I love. Sometimes those choices haven’t been easy, including at the beginning of my career when I took jobs with lower pay or left a company to do the work that really excited me. By relying on my passions, I’ve stepped into this new role that is really changing the future of mobility. What's the best advice you've ever been given? Or your favorite piece of #realtalk? Take the risk and do what you love. I had a professor in college who helped me see this when choosing my first job. Opportunities might not come again, so seize them. When you hit a bump in the road or come up against a problem, how do you find new roads? I’ve been lucky to lead great teams. When I’ve encountered challenges of time, resources or even inspiration, a team can help find a new road to success. TO SEE THE FULL CREATE & CULTIVATE STEM LIST CLICK HERE. FULL 2018 CREATE & CULTIVATE 100 LIST BELOW.